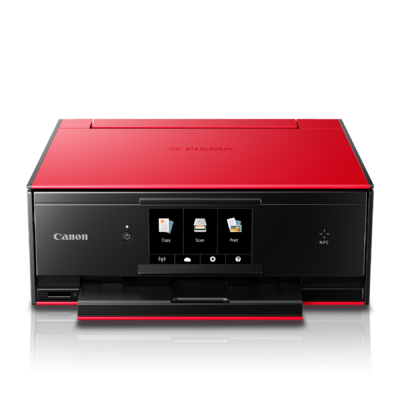 Looking for the ultimate, everyday colour printer for both documents and photos? 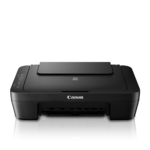 Then your search is over with the Canon PIXMA TS9020 Wireless Inkjet All-In-One Printer. In fact, it's one of the best wireless1 multifunction home printers you can buy. It's not only sleek and compact, it's stylish as well, and available in two-tone white/black and red/black case design options. Print homework assignments, shipping labels, CDs, DVDs and Blu-ray discs, envelopes, concert tickets and stunning family photos quickly and with ease. Connect all of your devices just as easily, because when it comes to wireless and wired connectivity, the PIXMA TS9020 printer is king. It features a built-in SD Card reader2, Wi-Fi1, Ethernet, Google Cloud Print3, AirPrint4 and Cloud5 options, plus NFC6 for your compatible smartphone. It's also a superb choice as an iPhone/ iPad printer. Plus, it's a snap to use with its large, easy-to-read 5.0" touch screen and enhanced user interface, document removal reminder and auto expandable output tray. Print quality is outstanding because several quality-enhancing features are built right in. 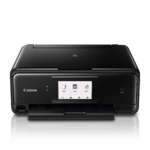 It has a six-colour ink system, including a dedicated gray ink tank, onboard creative filters and front-and-rear paper feeding options that even supports fine art paper – so you never have to compromise on image quality. Isn't it time to you brought home an exceptional home printer for all of your everyday document and photo needs? 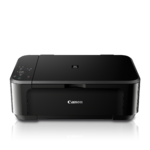 Then bring home the Canon PIXMA TS9020 Wireless Inkjet All-In-One Printer. 2 Compatible memory cards include SD Card, SDHC Card. The following can be used with the addition of a special adapter sold separately: miniSD Card, miniSDHC Card, microSD Card, microSDHC Card. 4 AirPrint functionality requires an iPad, iPhone 3GS or later, or iPod touch 3rd generation or later device running iOS 4.2 or later, and an AirPrint-enabled printer connected to the same network as your iOS device. A printer connected to the USB port of your Mac, PC, AirPort Base station, or Time Capsule is not supported. 5 Requires an Internet Connection. 6 Requires an Android mobile device with NFC hardware running Android 2.3.3 or later, and the Canon PRINT Inkjet/SELPHY app, available of free at Google Play. 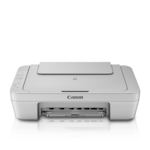 Canon PRINT Inkjet/SELPHY app must be open to use PIXMA Touch & Print. 7 Requires an Internet connection and the Canon PRINT Inkjet/SELPHY app, available for free on the App Store and at Google Play. Compatible with iPad, iPhone 3GS or later, and iPod touch 3rd generation or later devices running iOS 7.0 or later, and Android mobile devices running Android 2.3.3 or later. Your device must be connected to the same working network with wireless 802.11 b/g/n capability as your printer. Requires a compatible social media account and is subject to that social media account's Terms of Service. Certain exceptions may apply. 9 Works edited by using this application cannot be displayed, edited, or printed without this application. Compatible with Android device of 7 inches or more using Chrome (latest version compatible with your current version of Android OS), iOS Devices of 7 inches or more using Safari 5.1 or later, Windows PC (excluding RT) using Internet Explorer 10 or later of Microsoft Modern UI version, Microsoft Internet Explorer 9 or later, Mozilla Firefox 31 or later, or Google Chrome version 36 or later, and with Mac OS X 10.6.8 or later using Safari 5.1 or later. 10 "Full HD Movie Print" is available from "MOV" and "MP4" movie files created by select Canon EOS Digital SLRs, PowerShot, and VIXIA digital cameras and camcorders. Requires PC or Mac with Intel? processor and Canon ZoomBrowser EX 6.5 or later or Canon ImageBrowser 6.5 or later for "MOV" files, or Canon ImageBrowser EX 1.0 or later for "MOV" or "MP4" files. Print quality is determined by the video resolution. Function does not upscale video resolution. 11 Requires Android mobile device with Android 4.4 operating system or later with the Mopria Print Service pre-loaded with that device and the compatible PIXMA printer on the same wireless network. The Mopria experience is also available on Android 4.4 mobile devices with a download of the Mopria Print Service from Google Play. 12 To install using Windows? OS, .NET Framework 4 is required. Compatible still image formats are PDF (created using Canon PDF Creator only), JPEG (Exif), TIFF, and PNG. Compatible video formats are MOV (from select Canon digital cameras only) and MP4 (from select Canon digital camcorders only).